Multi-platform Arabic-language business and financial news service renamed and headquartered in the U.A.E. Saudi Arabia, 17 September, 2018: Following the announcement made last September by Bloomberg, the global business and financial information and news leader, and Saudi Research and Marketing Group (SRMG), the Middle East's biggest publishing group to launch Bloomberg Al Arabiya, a new multi-platform Arabic-language business and financial news service, Bloomberg and SRMG today announced that the news service has been renamed to Bloomberg Asharq. 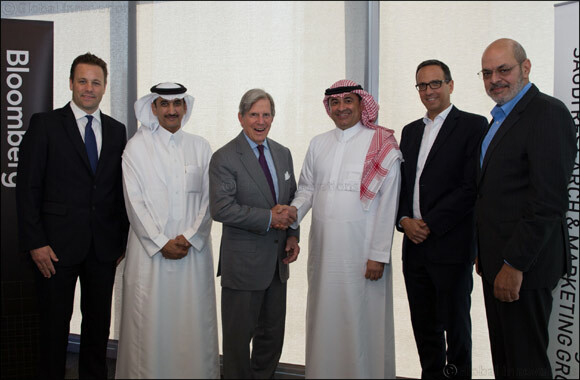 Peter Grauer, Chairman of Bloomberg L.P., and Dr. Ghassan Alshibl, Chairman, SRMG, met yesterday in Dubai to officially announce Bloomberg Asharq. They also unveiled the platform’s logo, which incorporates Arabic characters with Bloomberg’s global brand recognition. Bloomberg Asharq will be headquartered in the U.A.E., with the main operation in the Dubai International Financial Centre (DIFC). In Dubai, the DIFC's Gate Village 11 development, The Exchange, with views of the iconic Gate, will serve as the main hub for the new platform. Bloomberg Asharq will also have a major presence in Abu Dhabi, Riyadh, and Cairo, with studios in each city, along with extensive presence and coverage in key regional and global capitals. The Bloomberg Asharq team will be managed by SRMG, which also publishes more than 12 publications, including the popular daily Asharq Al-Awsat, Arab News, Aleqtisadiah and many others, with support from Bloomberg's extensive financial and economic content and market data as well as news from its 2,700 journalists and analysts globally. Bloomberg Asharq platforms will provide Arabic-speaking audiences around the world with news and analysis on the companies, markets, economies, social and political developments shaping the Middle East. This includes a 24/7 television and radio network and dedicated digital platform, Bloomberg Businessweek magazine in Arabic and a conference and live events series.